Three stainless steel burners; 7 mm stainless steel rod cooking grates; Porcelain-enameled Flavorizer bars; 32,000 BTU-per-hour input; 12. 000 BTU-per-hour input, flush-mounted side burner; Electronic Crossover ignition system; Primary cooking area 424 sq in; Warming rack area 105 sq in; Total cooking area 529 sq in; Fuel gauge; 6 Tool hooks; Stainless steel lid with a center-mounted thermometer and painted aluminum end caps; 2 Stainless steel fold-down tables; 2 Stainless steel work surfaces; Front-mounted control panel; Painted enclosed steel cabinet with painted steel door; Front access, porcelain-enameled grease tray with catch pan; 2 Heavy-duty front locking swivel casters; 2 Heavy-duty back swivel casters; FOR STORE ONLY – NOT ENOUGH MARGIN FOR ONLINE SALES / SHIPPING FEES. This stainless steel rendition of the popular Genesis gas grill creates an atmosphere of pure grilling excellence! The stainless steel Weber Genesis S-330 features 3 stainless steel burners that produce 38,000 BTUs and a 10,000 BTU Sear Station, each with independent electronic ignition. The specially designed searing area allows you to sear like a professional for restaurant-quality steaks, without taking away traditional grill space. The Genesis S series propane gas grill comes fully equipped with 7mm stainless steel rod cooking grates, porcelain-enameled heat deflectors and stainless steel Flavorizer bars which add flavor from drippings to your food and distribute heat over the 507 square-inch main cooking grid. The warming rack provides an additional 130 square inches for a generous 637 square inches of total cooking area. Genesis grills come equipped with a porcelain-enameled grease tray with a catch pan to make clean-up as easy as possible. This Weber S-330 also has a 12,000 BTU flush-mounted side burner that lets you multi-task while grilling by cooking side dishes and warming sauces right next to the grill. The stainless steel shroud will withstand the elements for years to come, has a center-mounted thermometer to monitor cooking temperatures and is accented with a polished stainless steel handle and painted cast-aluminum end caps. This Weber Genesis grill has a painted steel frame and front-mounted control knobs to leave more room on the two stainless steel side shelves for prep space. The grill cart features stainless steel doors and handles, painted side and rear panels and four heavy-duty casters (2 locking and 2 swivel). The enclosed tank storage area keeps your propane tank out of sight and the precision fuel gauge lets you know exactly where you stand on fuel at all times. Six convenient built-in tool hooks keep your BBQ tools nearby. With top-notch engineering, you will quickly realize that Weber Genesis grills are unlike any other! Please note, the grill height dimension listed in the specifications are with the grill lid open. This stainless steel rendition of the popular Genesis gas grill creates an atmosphere of pure grilling excellence! The stainless steel Weber Genesis S-330 features 3 stainless steel burners that produce 38,000 BTUs and a 10,000 BTU Sear Station, each with independent electronic ignition. The specially designed searing area allows you to sear like a professional for restaurant-quality steaks, without taking away traditional grill space. The Genesis S series natural gas grill comes fully equipped with 7mm stainless steel rod cooking grates, porcelain-enameled heat deflectors and stainless steel Flavorizer bars which add flavor from drippings to your food and distribute heat over the 507 square-inch main cooking grid. The warming rack provides an additional 130 square inches for a generous 637 square inches of total cooking area. Genesis grills come equipped with a porcelain-enameled grease tray with a catch pan to make clean-up as easy as possible. This Weber S-330 also has a 12,000 BTU flush-mounted side burner that lets you multi-task while grilling by cooking side dishes and warming sauces right next to the grill. The stainless steel shroud will withstand the elements for years to come, has a center-mounted thermometer to monitor cooking temperatures and is accented with a polished stainless steel handle and painted cast-aluminum end caps. This Weber Genesis grill has a painted steel frame and front-mounted control knobs to leave more room on the two stainless steel side shelves for prep space. The grill cart features stainless steel doors and handles, painted side and rear panels and four heavy-duty casters (2 locking and 2 swivel). Six built-in tool hooks and the enclosed storage area allow you to keep your BBQ tools and accessories nearby. A 10-foot flexible natural gas hose is included. With top-notch engineering, you will quickly realize that Weber Genesis grills are unlike any other! Please note, the grill height dimension listed in the specifications are with the grill lid open. Summit Series gas grills are the crown jewels of the Weber family, with exclusive features, the highest level of performance and stunning looks. 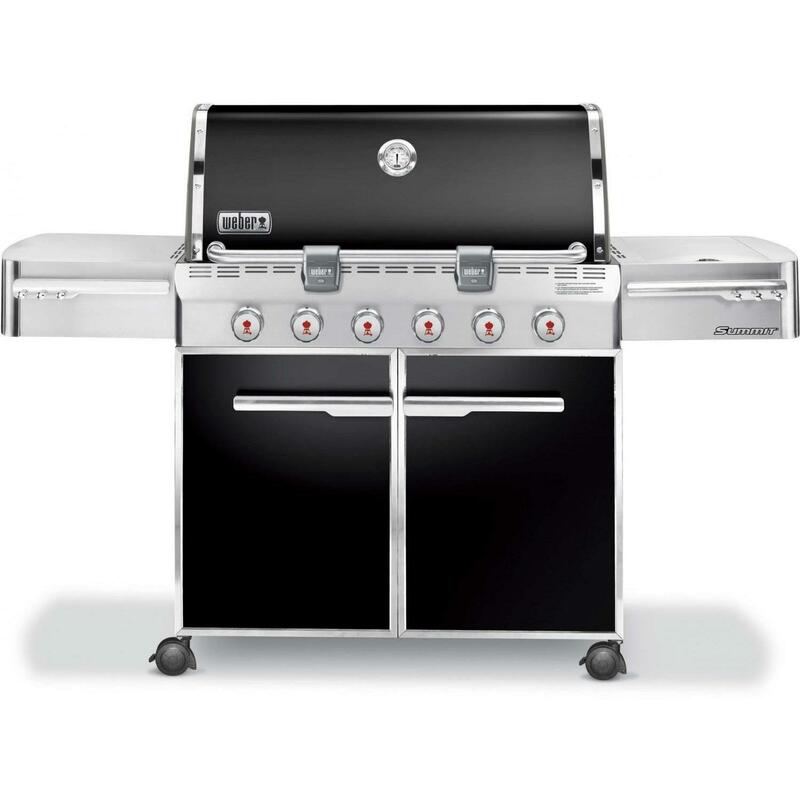 Move on up to the top with the Weber Summit S-420, which sizzles with distinction. 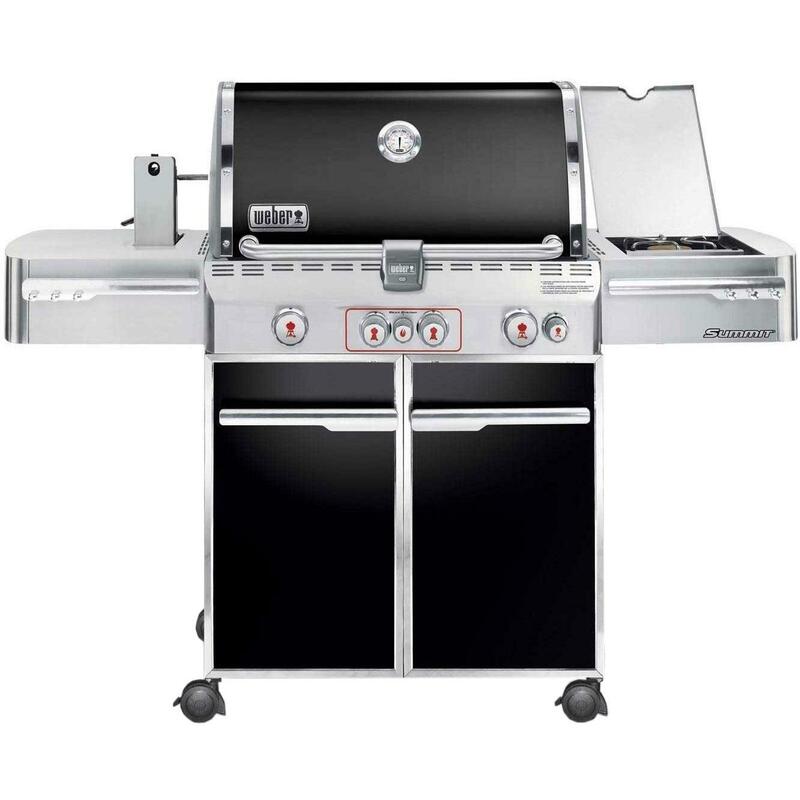 The stainless steel S-420 features 4 stainless steel burners that produce 48,800 BTUs and a 12,000 BTU flush-mounted side burner that lets you multi-task while grilling. The Snap-Jet individual burner ignition system helps you get the party started as quickly as possible. The Summit S series propane gas grill comes fully equipped with 9mm (3/8 inch) stainless steel rod cooking grates and stainless steel Flavorizer bars to effectively hold and distribute heat evenly over the 538 square-inch main cooking grid. The warming rack provides an additional 112 square inches for a generous 650 square inches of total cooking area. Summit grills come equipped with a stainless steel grease tray with a catch pan to make clean-up as easy as possible. The stainless steel shroud will withstand the elements for years to come and has a polished stainless steel handle and a center-mounted thermometer to monitor cooking temperatures. This Weber Summit grill has a painted steel frame and a front-mounted control panel with a backlit LED propane scale, which works in conjunction with the precision fuel gauge to let you know exactly where you stand on fuel at all times. The grill cart features stainless steel doors, chrome plated cast-aluminum handles, painted side and rear panels and four heavy-duty casters (2 locking and 2 swivel). The enclosed storage area keeps your propane tank out of sight, two stainless steel side shelves with painted cast aluminum end caps provide expansive prep space and the six convenient built-in tool hooks keep your BBQ tools nearby. Light up your grill with the Grill Out handle light, which features an integrated tilt sensor that automatically turns the light on when the lid is raised and off when the lid is closed. 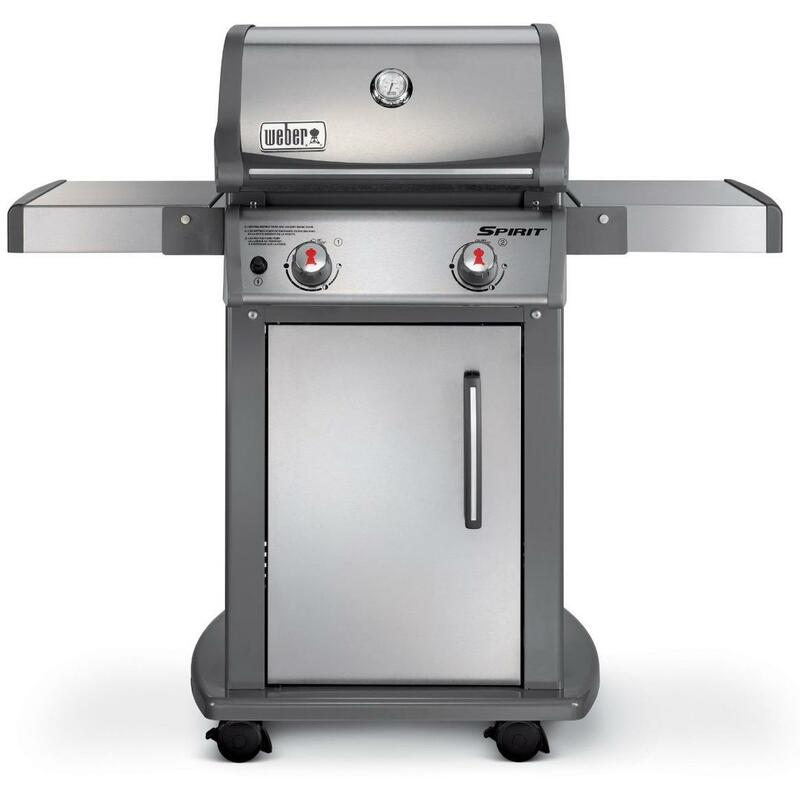 With the Weber Summit S-420, welcome to the top-of-the-line! Please note, the grill height dimension listed in the specifications are with the grill lid open. Summit Series gas grills are the crown jewels of the Weber family, with exclusive features, the highest level of performance and stunning looks. You will enjoy the view of the Weber Summit E-420, but it adds more than just style to your backyard. The porcelain-enameled E-420 features 4 stainless steel burners that produce 48,800 BTUs and a 12,000 BTU flush-mounted side burner that lets you multi-task while grilling. The Snap-Jet individual burner ignition system helps you get the party started as quickly as possible. The Summit E series propane gas grill comes fully equipped with 9mm (3/8 inch) stainless steel rod cooking grates and stainless steel Flavorizer bars to effectively hold and distribute heat evenly over the 538 square-inch main cooking grid. The warming rack provides an additional 112 square inches for a generous 650 square inches of total cooking area. Summit grills come equipped with a stainless steel grease tray with a catch pan to make clean-up as easy as possible. The black porcelain-enameled hood has a polished handle and trim, center-mounted thermometer to monitor cooking temperatures and cast-aluminum end caps. This Weber Summit grill has a painted steel frame and front-mounted control panel with a backlit LED propane scale, which works in conjunction with the precision fuel gauge to let you know exactly where you stand on fuel at all times. The grill cart features painted steel doors, chrome plated cast-aluminum handles, painted side and rear panels and four heavy-duty casters (2 locking and 2 swivel). The enclosed storage area keeps your propane tank out of sight, two stainless steel side shelves provide expansive prep space and the six convenient built-in tool hooks keep your BBQ tools nearby. Light up your grill with the Grill Out handle light, which features an integrated tilt sensor that automatically turns the light on when the lid is raised and off when the lid is closed. With the Weber Summit E-420, welcome to the top-of-the-line! Please note, the grill height dimension listed in the specifications are with the grill lid open. Once you see the sheer enormousness of the Ranch Kettle grill, you will understand why big is an oversized understatement. Weber combines traditional, iconic design with innovation in production in this massive grill that is large enough to cook for family reunions or other large events. Made of premium-grade U. S. Steel coated with porcelain enamel inside and out, the bowl and lid of the Weber Ranch Kettle charcoal grill are precisely formed to allow heat to circulate evenly across the huge cooking area. The black porcelain-enamel coating is baked on, fusing the finish to the steel to prevent rusting and peeling through years of use. With the versatile Ranch Kettle grill, you have the option of indirectly cooking large amounts of food by placing charcoal on one side of the grill and food on the other, which creates convection-style heat circulation. The adjustable top vent provides the proper airflow needed for perfect grilling and helps you to control the temperature inside the grill. 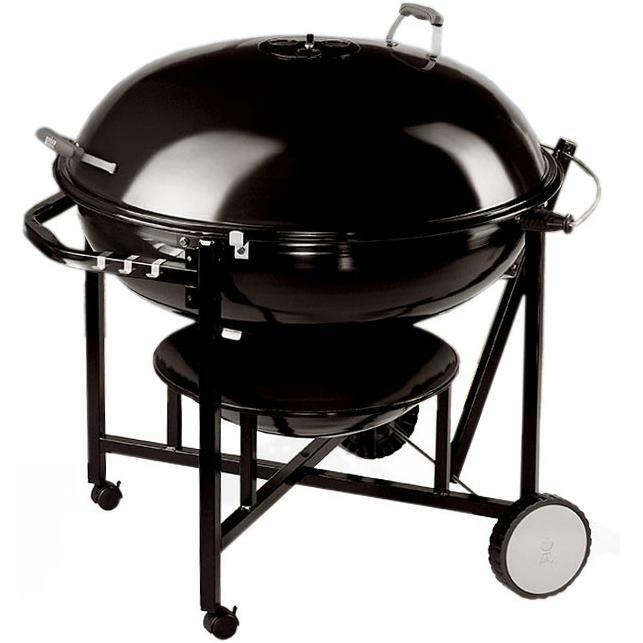 This Weber Ranch Kettle grill also features a hinged stainless steel cooking grate, for easily adding more charcoal, two glass-reinforced nylon handles that will withstand the elements for the life of the grill, tool hooks and a Tuck-Away lid holder that conveniently allows you to store the lid while you grill. The high-capacity, porcelain-enameled ash catcher lifts out for easy ash disposal and cleaning. The heavy-duty steel cart ensures the grill is sturdy and stable, while two crackproof all-weather wheels and two locking casters make moving the grill easy. A massive take on a classic, dependable design, the Weber Ranch Kettle Charcoal Grill is designed for the griller ready to take it to the next level! Summit Series gas grills are the crown jewels of the Weber family, with exclusive features, the highest level of performance and stunning looks. You can go big with the porcelain-enameled Weber Summit E-620, which features 6 stainless steel burners that produce 60,000 BTUs and a 12,000 BTU flush-mounted side burner that lets you multi-task while grilling. The Snap-Jet individual burner ignition system helps you get the party started as quickly as possible. The Summit E series propane gas grill comes fully equipped with 9mm (3/8 inch) stainless steel rod cooking grates and stainless steel Flavorizer bars to effectively hold and distribute heat evenly over the 693 square-inch main cooking grid. The warming rack provides an additional 145 square inches for an enormous 838 square inches of total cooking area. Summit grills come equipped with a stainless steel grease tray with a catch pan to make clean-up as easy as possible. The black porcelain-enameled hood has a polished handle and trim, center-mounted thermometer to monitor cooking temperatures and cast-aluminum end caps. This Weber Summit grill has a painted steel frame and front-mounted control panel with a backlit LED propane scale, which works in conjunction with the precision fuel gauge to let you know exactly where you stand on fuel at all times. The grill cart features painted steel doors, stainless steel handles, painted side and rear panels and four heavy-duty casters (2 locking and 2 swivel). The enclosed storage area keeps your propane tank out of sight, two stainless steel side shelves provide expansive prep space and the six convenient built-in tool hooks keep your BBQ tools nearby. Light up your grill with two Grill Out handle lights, which feature an integrated tilt sensor that automatically turns the lights on when the lid is raised and off when the lid is closed. 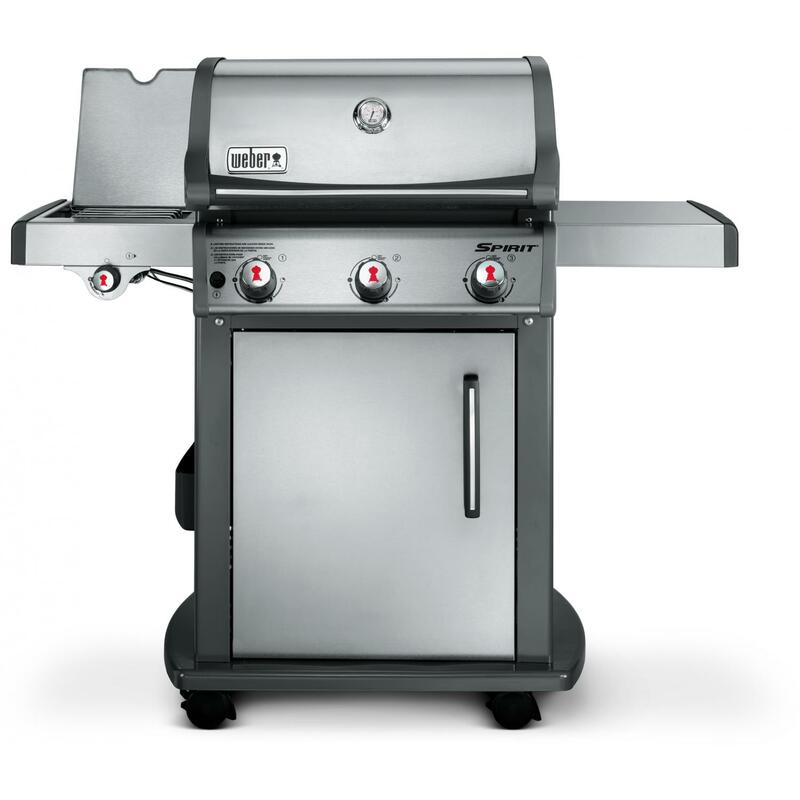 With the Weber Summit E-620, welcome to the top-of-the-line! Summit Series gas grills are the crown jewels of the Weber family, with exclusive features, the highest level of performance and stunning looks. The Weber Summit E-470 is beauty redefined, but it adds more than just style to your backyard. The porcelain-enameled E-470 features 4 stainless steel burners that produce 48,800 BTUs and a 10,600 BTU Sear Station, each with Snap-Jet individual burner ignition to help you get the party started as quickly as possible. The Summit E series propane gas grill comes fully equipped with 9mm (3/8 inch) stainless steel rod cooking grates and stainless steel Flavorizer bars to effectively hold and distribute heat evenly over the 468 square-inch main cooking grid. The warming rack provides an additional 112 square inches for a generous 580 square inches of total cooking area. Summit grills come equipped with a stainless steel grease tray with a catch pan to make clean-up as easy as possible. This Weber E-470 also has a 12,000 BTU flush-mounted side burner that lets you multi-task while grilling, a stainless steel smoker box with a dedicated 6,800 BTU smoker burner and a 10,600 BTU infrared rotisserie rear burner. The Tuck-Away rotisserie system features a flip-up motor and separate spit rod and fork storage inside the cart. This Weber Summit grill has a porcelain-enameled frame and lid and a front-mounted control panel with LED lighted control knobs and a backlit LED propane scale, which works in conjunction with the precision fuel gauge to let you know exactly where you stand on fuel at all times. The attractive black hood has a polished handle and trim and a center-mounted thermometer to monitor cooking temperatures. The grill cart features an enclosed storage area to keep your propane tank out of sight and four heavy-duty casters (2 locking and 2 swivel). The two stainless steel side shelves provide expansive prep space and the six convenient built-in tool hooks keep your BBQ tools nearby. Light up your grill with the Grill Out handle light, which features an integrated tilt sensor that automatically turns the light on when the lid is raised and off when the lid is closed. With the Weber Summit E-470, welcome to the top-of-the-line!